Premium quality wrinkle-free durable fabric with reinforced elastic around deep pocket fitted sheet. 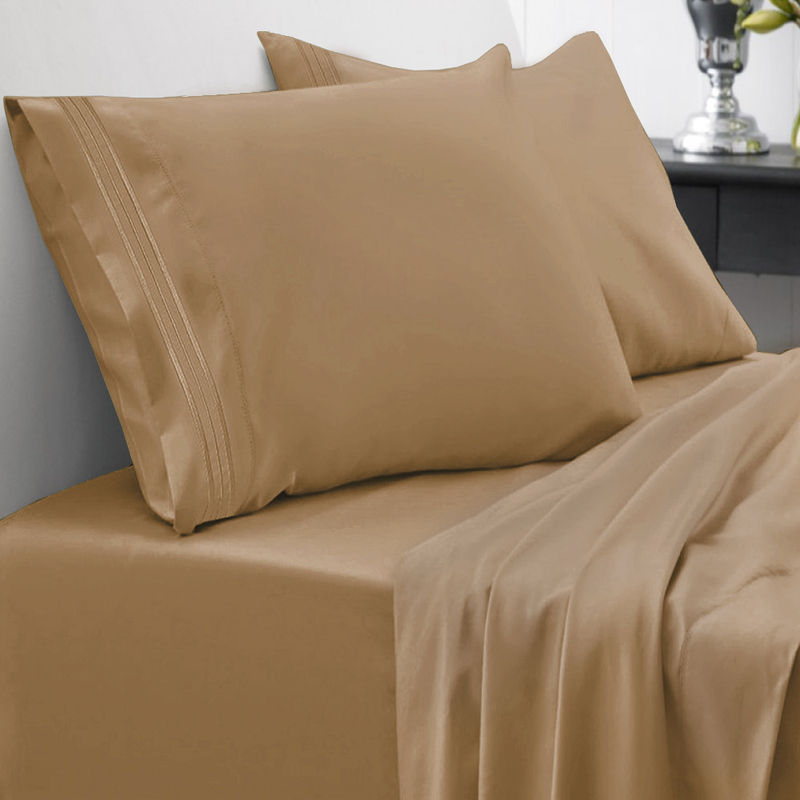 Top Selling extra soft and breathable 4-Piece sheet set. Includes hotel style triple embroidery on pillowcases. Choose from over 30%2B colors and prints in all sizes! Fits mattresses up to 16 inch deep for most sizes. Easy care, machine washable. I love these sheets! I bought a queen set in Berry, they shipped out quickly and I picked them up at the store. I bought this set, hoping that their selling point of deep pockets that won't pull off mattress corners, was true. These sheets and pillowcases are very soft, comfortable, color is true to color online, well made, no loose threads and the corners stay put - just what I was hoping for. Someone mentioned that these sheets were thin, but the sheets in this set I purchased, are not thin, they are thicker and denser than my other sheets, as expected in a higher thread count. Now my husband wants me to buy a couple more of these queen sheet sets in different colors - he told me he has a better night's sleep on these sheets. Very happy with quality. Tbook.com crawls the web to find the best prices and availability on products like Sweet Home Collection 1500 Thread Count 4 Piece Microfiber Bed SHeets Set. This product is one of the more popular items we list which is why it is in our "hot deals" section. If you have any questions on this product, please give us a call at 734-971-1210 during the hours of 9am - 5pm EST for assistance. Thank you for shopping at Tbook.com, the Internet Department Store!